Despite resistance, a bolder Bangladesh Inland Water Transport Authority (BIWTA) on Tuesday appeared to be tougher in its actions to clear illegal structures on the dying Buriganga river that crosses capital Dhaka. The BIWTA officials have come back after a 12-day break armed with authority to ignore any resistance and carry forward Prime Minister Sheikh Hasina order to bring back all the rivers to its original form and free from all kind of illegal structures. BIWTA officials they would dig the river beds where needed to give back the river its lost look of pristine blue water. The BIWTA is set to purchase 13 more excavators to quicken the process. On the first day of the second phase of the drive to recover river the once mighty Buriganga, BIWTA moved to demolish structures on the major “Modhu City’ at Modder Char and Bosila bridge. The much debated “Amin Momin” housing project of an influential contractor of BIWTA would also have the same fate despite efforts to save it from the government action. BIWTA will take more steps to ensure that the Buriganga gets back its original flow, he said. During the drive many of the land grabbers p[rotested the eviction and tried to stop the operation. But the BIWTA officials gave them a deaf ear. 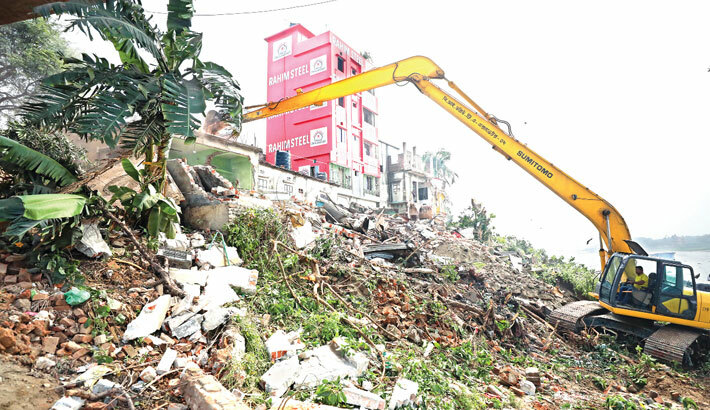 During the drive BIWTA bulldozed 57 illegal structures and 31 boundary walls to 10.5 acres of river land including five three storied buildings, four two storied buildings, 19 one storied buildings. Apart from that it also bulldozed 22 semi-concrete buildings and 7 tong shops. A BIWTA team led by joint director A K M Arif Uddin went to Madhar Char area and Southern part of Mohammadpur Bosila Brige area around 9:30 am on Tuesday. Modhu City, a housing project stretching about three kilometers comprising on the banks of Buriganga river and comprising of Jhawchar, Uttarchar and Baluchar villages, have already sold thousands of plots on land they grabbed from the river in Keraniganj. BIWTA officials said, the housing company planted hundreds of trees and set up boundary walls as a trick on the grabbed land hoping they would be spared. The drive would continue till 28 March and might be extended, subject to decision of the authorities if more areas in Ahsulia are to be covered. During the inspection the river banks on Monday, Md Abdus Samad said, the money to dig encroached portion of river may be realized from those grabbers who filled the river body and erect structures. Chairman of BIWTA Commodore M Mahbub-ul Islam, deputy secretary of ministry of shipping Md Maniruzzaman Miah, director of BIWTA (port) Md Shofiqul Haq additional director (Port) Md Rafiqul Islam and others inspected the drive. BIWTA launched the drive recover the land of rivers at the last segment of juanry this year. Till now it has demolished 1721 establishment knocked to ground in 12 days.